The O Panneerselvam faction of the AIADMK on Thursday moved the Election Commission challenging the election of V K Sasikala as general secretary of the party, saying she was elevated in violation of the norms. A 12-member delegation of the faction led by Rajya Sabha MP V Maitreyan met Chief Election Commissioner Nasim Zaidi and other top officials, and submitted a memorandum demanding that it decline approval to her elevation to the top party post. In its 42-page petition, the delegation claimed Sasikala’s election was violative of the party constitution as she was chosen by the general council of the party and not the primary members. It said the general council was empowered to frame policies and programmes, and not elect someone as general secretary. The representation also quoted clause 30 (V) of the party constitution to say that a person was required to be a primary member of the party for five years for being eligible for the post. 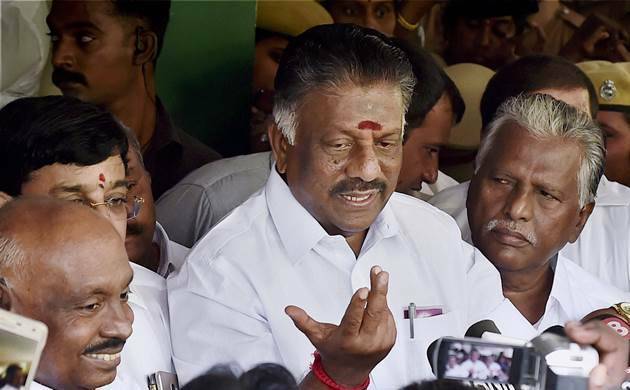 The Panneersalvam camp said she was expelled from the party on December 19, 2011 and taken back in March the next year, resulting in a break in her primary membership.Panneerselvam, the outgoing Tamil Nadu Chief Minister, expelled from AIADMK by Sasikala, has claimed she lacked necessary powers to sack him. He also said in Chennai today that his fight against Sasikala and her family will continue till the time “J Jayalalithaa’s regime is restored”. “Let us all together stop the party and government from going into the hands of a single family again. Let us form a people’s government again in sync with the aspirations of people and till then this struggle will continue,” he said.